This post has been sitting in my draft folder for far too long. Perhaps the answers to the title of the post are less rhetorical than the title suggests, but I have been wondering lately what the role of Thinks Tanks in the international development industry really is. Don’t get me wrong: Many great colleagues do great work at great thinks tanks and I received my PhD from a prominent institution that works partly as an academic department, partly as a think tank and partly as a consulting firm. But it’s 2019 after all and I wonder what would happen if they/many/some weren’t around anymore. Haven’t other institutional arrangements caught up to think-tanky ways of working? And isn’t most of their evidence-based research ignored or watered down anyway because all they do is confirming the “leftist” narrative that a lot of aid works, migration is a win-win game and handing out cash in humanitarian situations can only freak out UK tabloid media brand readers these days? My main point is not “let’s get rid of think tanks”, but rather “other arrangements are doing a lot of the work that think tanks used to be doing”-so maybe there is time for upgrades, mergers or...? The very notion of independent Think Tanks as places where knowledge is generated, translated and communicated in a policy-relevant way has been challenged by different institutions, including academia, media, NGOs or foundations. Aren’t universities Think Tanks anyway? Many university departments and institutes have become much better in communicating their research or “influencing policy”-whether by choice or by force of a changing, neoliberal policy agenda around “impact” and engagement with various “stakeholders” in society. Even mentioning the term “ivory tower” these days will only lead to mild eye-rolling-especially in the field of international development. Think Tank staff often have teaching gigs especially in the big Western capital cities-so incorporating them into a university department seems like a win-win for academics, students and the broader public. Rather than relying on precarious adjuncts universities could incorporate full-time staff who can take care of teaching alongside research and dissemination tasks. It is not just university departments that have been “catching up” on Think Tank business. The boundaries between different institutions are changing rapidly: Not only do universities communicate more and often better, but journalism is changing with new platforms, more data and possibly more polarization. But whether we talk about new non-profit forms of journalism, data journalists, multi-country investigations or new forms of storytelling, some areas of journalism have become much more explicit about their aims to influence society. NGOs also communicate more and better and their advocacy efforts often produce high-impact policy papers, campaigns etc. And a stream of journalists has joined corporate communication and PR-so even the private sector is communicating their positions in new ways-especially around CSR, sustainable business and the likes. So where do thinks tanks fit in as independent structures? In an era of platform capitalism and virality who reads or engages with all the output? 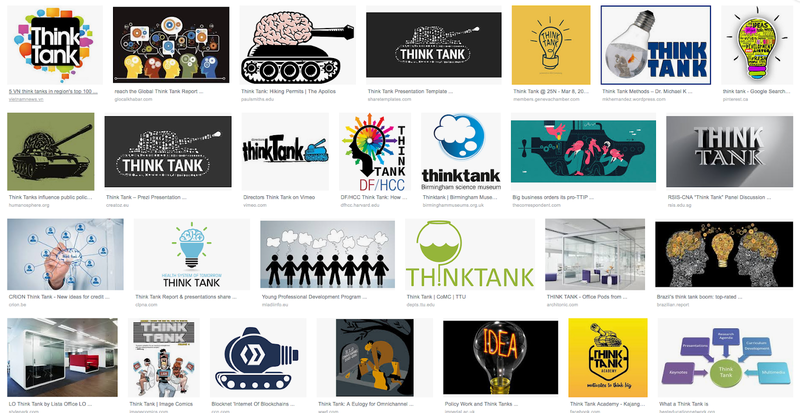 You can probably name 2-3 big Think Tanks-the really big brands. But what about the bottom of the iceberg? For every self-published fiction best-seller there are thousands of terrible books lingering around Amazon, and for every viral music video there are those that nobody watches or whose 1,765 views generate next to no revenue. Isn’t there an equivalent for Think Tank output? I’m trying to imagine all the pdf reports published by Thinks Tanks in Washington, Brussels, Berlin or London that pretty much nobody will ever read, brown bag lunches that are quickly forgotten and time-consuming panels and workshops that are organized to simulate outreach in a saturated environment. I sometimes wonder whether staff at Think Tanks are a bit jealous of, say, Dan Drezner, Zeynep Tufekci, Bill Easterly or Sarah Goldrick-Rab with their powerful op-eds, large Twitter following, books and multiple forms of public engagement with clear policy-relevance. Sure, many of the big brand Think Tanks also have great staff who are visible in those ways, but couldn’t they just work at any university department, non-profit journalism outlet or thematic (I)NGO for example and do a similar job with fewer overheads and expensive offices in central locations? I noticed that in Berlin for example more and more one or few person outlets have sprung up over the past 10-15 years that may provide an institutional platform for someone, but rarely build any momentum along traditional policy impact lines. Well, actually, research has not become easier. A lot of mediocre Thinks Tanks tend to publish mediocre research- small n-research, a few focus groups or analysis conducted by a staff member who may not have the experience to tease out the nuances of findings from a data set. This often seems to happen for small/new/one-person outfits that are entering a saturated market. In an age when “experts” get easily criticized it is important to do research well, spend time on the analysis-and admit that you won’t always have spectacular findings that will make headlines-which is difficult for smaller Thinks Tanks who need to prove “impact” to future donors. No Think Tank will admit that they are no longer as relevant as they were when founded 20, 30 or more years ago-every bureaucratic institution tends to re-invent itself when times are changing-from UN organizations to NATO, OSCE and university departments, of course. But if Think Tanks want to stick around is there anything they could do to think out of the tank...box and reinvent themselves?